Renault Release 'E.V.' Prices- batteries not included! Mark O'Byrnes went along on Motorcheck's behalf to the Fitzwilliam hotel this week where Eric Basset, MD for Renault in Ireland, was announcing new details for the companies Electric Vehicle (EV) strategy. Finally Renault were in a position to release some pricing information which we're pleased to bring you below. The first major piece of news was Renault’s announcement that it intends to lease its batteries separately to the purchase of the actual vehicle. The company believes that this will increase the resale value of its electric vehicles as future improvements in battery technology can be enjoyed in the same car by subsequent owners and not limit its appeal by tying it down to older technologies surpassed by longer ranges and quicker charging times. The Kangoo van will be available from September 2011 and will cost €20,000 however after Government incentives the price comes in at a more modest €15,870 (Ex VAT). The battery will cost €72.00 P.M to lease. 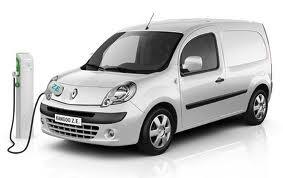 The Kangoo has a 60 HP motor with 167 lb-ft of torque, which is more torque than the 1.5 DCI. The 22 kWh lithium-ion battery should provide a range of around 100 miles. The Fluence will be available in early 2012 at a cost of € 21,620 after the Government rebate of €5,000. The battery will cost € 79.00 P.M, over 48 months, again with a range of 100 miles, and a top speed of 84 MPH. Renault say the cost of the Fluence including battery leasing and electricity will be around the same price of the equivalent Diesel. 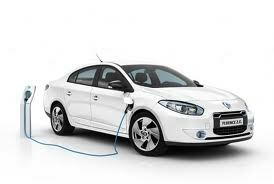 However, the electric Fluence as with all E.V’s, will have no oil changes, filters, and timing belts to maintain. You could even charge the battery from your own renewable energy system if you are fortunate enough to have one. The Zoe is Slightly smaller than the current Clio and although the price has not been finalised, Mr. Basset said it will be in a similar price bracket to the Clio. It will have a range of 100 miles and a top speed of 90 MPH. It’s great to see the line up of electric vehicles improving all the time. Renault tells us that they will have an E.V. road show in June 2011 giving people all over the country a chance to see the EV’s up close and personal. My Two Year Old has a Bone to Pick with Renault. Co-Founder at Motorcheck.ie and Benchmark Fleet Services Ltd.